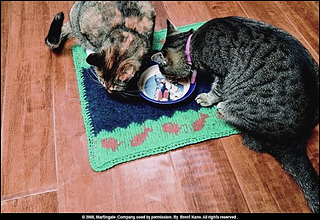 This is a placemat for your kitty’s food dish- knit in the stranded colorwork technique. Two halves are knit in the round, steeked and felted. 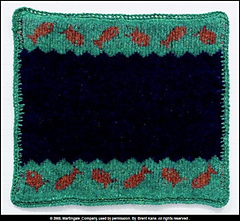 It requires two 50-gram skeins each of dark blue and aqua-colored worsted wool and one 50-gram skein of gold/orange for the gold fish. Non-stick backing is sewn on after felting.